Forage Sorghum or Cane, is best used for hay, bundle feed, or freeze down grazing. Harvest in the soft dough stage for hay. Forage Sorghum has good drought tolerance making it a great choice for dryland situations. 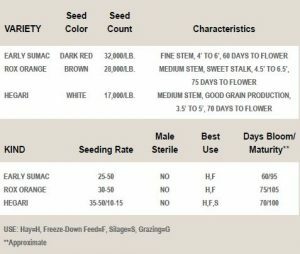 Forage Sorghum is Non-Male Sterile, meaning it will put on a viable seed head. Planting Date: June 1-July 15.